As I drove to work this morning, I encountered snow-covered roads from the powerful wind gusts that drifted roads closed overnight. Most roads on my journey this frigid February morning were completely covered except for slightly clear tire paths in each lane. To be safe, I steadied my steering wheel against the gusting winds to keep my tires in those already-cleared tracks from travelers who had driven the same path before me. It was harrowing at times with the drifting snow impacting visibility but I knew if I was able to keep my vehicle in those worn paths, I’d have better traction and stability. I imagine many people drive like me in this kind of weather … slow and steady, staying in the driven paths to avoid slipping and sliding in collections of snow and ice, and staying alert for traffic signals ahead indicating a stop in slippery slush. I also know that often there are others who throw caution to the wind and drive as if the roads are clear. I know this, because they pass me in unplowed passing lanes at unsafe rates of speed and then spatter my windshield with slushy muck that impairs my view. Sometimes I see them further up the road with their vehicle stuck in a ditch. While driving cautiously this morning in the clear tracks before me, I thought about the trepidation people have about future healthcare choices and decision-making. When my Mom fell ill for the last time, and we started hospice, it felt as though we were blazing the trail anew and we were both fearful of what was ahead. Because we had hospice care for only a short time, we never really had the benefit of spending a lot of time talking with the hospice team who had been down this road before. None of my immediate circle of friends had traveled this road of hospice care and family caregiving before me. 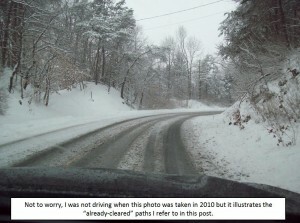 There were no “already-cleared tracks” for me to keep my tires in. But 11 years after Mom’s death, when my Uncle Warren needed hospice care, I’d been down that road before and so I had much better preparation for what was ahead. I sometimes think people are tentative to start conversations because they don’t know what’s ahead. Because they don’t know how to find the already-cleared tracks before them. Caring Choices has traveled the road of healthcare decision-making with patients and families, and with our own loved ones. We understand the fear of the unknown. We recognize the challenges of having emotional conversations. We also know that having someone along for the ride who is familiar with the road can make a world of difference in the journey. This entry was posted in Advance Care Planning on February 15, 2015 by Cindy Moyer. Throughout my 10 years of service as an RN with Hospice and 20 plus years in the nursing field in general, I have been exposed to a vast array of situations and outcomes which have shaped my current view on medical care during end of life, including insurance coverage and the various types of forms designed to guide treatment and decisions along the way. I have seen these preparations serve both as a guide for care and also as an obstacle needing to be overcome. If the dialog, interpretation, and enforcement of these documents alone will not ease suffering or maintain a safe, comfortable environment for patients – due to legalities and malpractice concerns – there has to be a change in our approach to these situations. In this NYTimes article, there is a very dramatic accounting of the exact obstacle documents can sometimes create. And having been in the moment and present during countless deaths, where there are no panels of discussion, review boards, or appeal courts, suffering is only witnessed with eyes of empathy and love. The need for all the clinical and legal forms remains unchanged by the fact that forms are sometimes an obstacle. What can be altered is making the choice to have the courage to discuss the outcomes of advancing age, worsening disease and potential consequences of sudden life-altering trauma. No one wants to talk about the “negative” stuff. Yet the majority of our lives, after we reach our 30s and 40s, seems consumed with it. Conversations between two reunited old acquaintances become more about doctors, medications, hospitalizations, recent surgeries, and limitations due to failing health than about social gatherings, future plans for travel, and entering new adventurous careers. That’s just life, right? And so wouldn’t conversations about healthcare decisions and ultimate death be appropriate at this same time in our lives? Caring Choices urges everyone to stay in the moment. Realize the importance of loving discussions with gentle kindness can make a difference for you and your loved ones. Even the loneliest soul on earth has the right to live their life in safety and comfort. Right up to the moment it ends. Talking with your family, doctor, caregivers, and legal counsel can only help to assure that somebody will do everything that you want in the way that you hope. This entry was posted in Advance Care Planning, Personal Stories on February 8, 2015 by James Desiderati.